Perhaps you’ve heard about PSY, the Korean singer turned international sensation overnight. He’s best known for making fun of rich people in an area known as Gangnam, Seoul, and for dancing like he’s riding on a horse. God only knows how the song became such a hit. I don’t think anyone saw his success coming, but that’s beside the point. Last night I got to see PSY perform at Seowon University in Cheongju, South Korea, during the peak of his worldwide fame. That’s something not many people can say they did. So, basically I’m awesome. Like most things in my life; however, the moments leading up to his performance were completely out of my control and not so awesome. My life is like a movie. Nothing ever goes according to plan, which causes a lot of awkwardness and drama. Someone grab a camera and start filming, please. I hopped on my bike to meet one of my co-teachers for dinner in Cheongju before the concert. We scheduled to meet around 6PM, which gave me about 30 minutes to bike 15 kilometers. I almost made it in time, but just as I was about there I got a flat tire. I had to walk my bike to the nearest repair shop, and ended up being extremely late for our “dinner date”. Somehow at the Vietnamese restaurant we were caught by another teacher from our school, my former co-teacher, and it became an incredibly uncomfortable situation. Of course my former co-teacher thought we were on a date. Maybe we were, but I wasn’t aware of that information ahead of time. It’s not very common to see a man and woman together as “friends” in Korea. Usually it’s safe to assume they’re either on a date, or already a couple if you do. It’s a little different with foreigners, but people still wonder. And now rumors will probably spread. From the moment we arrived at the venue we became part of a massive hot mess. Since PSY was booked to perform long before his crazy stardom, the university wasn't able to properly prepare. A pushing crowd was yelled at for about an hour. Then everyone was forced to sit in the dirt. I’ve never observed such a scene. Just when I didn’t think it could get messier, a drunken Korean girl shoved her way through the audience for a closer spot in front of us. Her boyfriend was along for the ride. By this time we were submerged in a sea of Koreans. There was barely room to breathe, but that didn’t stop the intoxicated couple from dancing inappropriately. People around us started getting angry. Before long the most dramatic Korean fight I’ve ever witnessed broke out. It involved crying, screaming, swearing (some in English), kicking, a big slap in the face, broken glasses, and more crying. We were so close to the fight I was practically involved. Thankfully, the drunkards were defeated by popular demand. 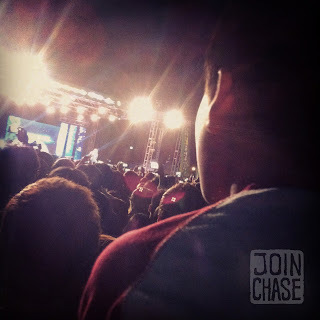 Little boy watching PSY perform in Cheongju, Korea. After a few hours of waiting in anticipation, PSY finally took to the stage. I cared more about watching the audience go crazy than I did the actual performance. Honestly, the fight was more entertaining. 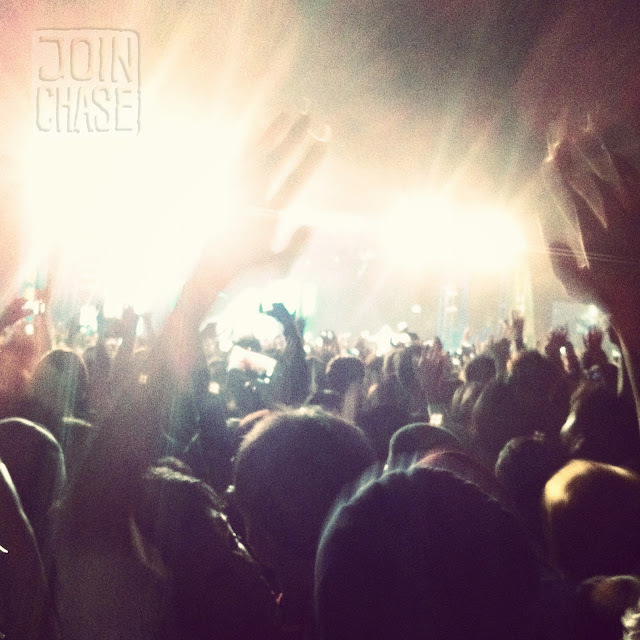 But, I felt like part of history just being there, part of something bigger than me. 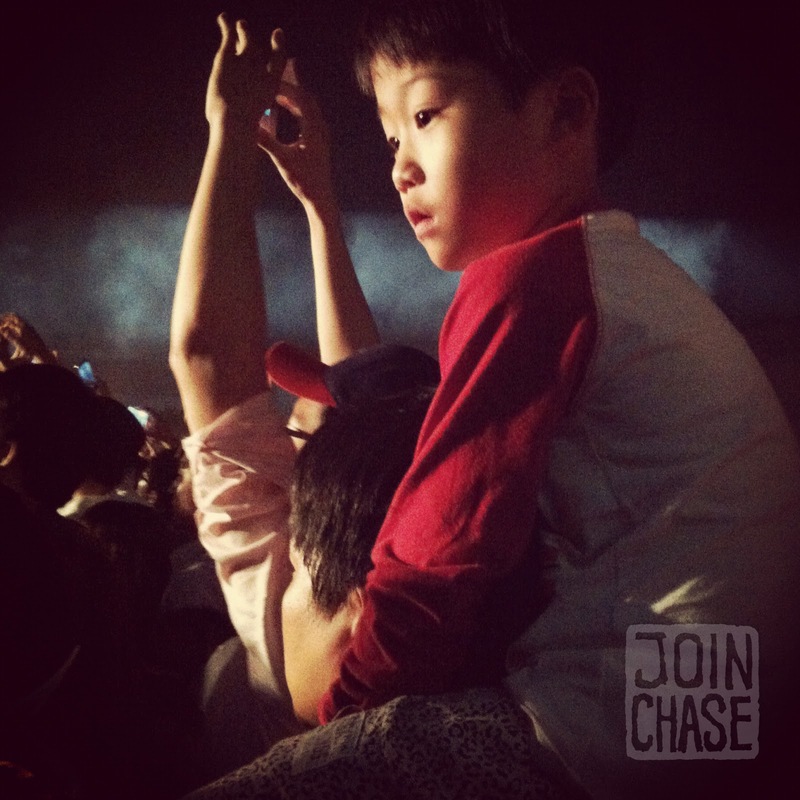 I caught a glimpse of a little boy on his daddy’s shoulders. I couldn’t help but wonder what he thought of it all. How funny everyone must look doing the horsey dance around him. I left immediately after Gangnam Style. The last thing I wanted to do was make my way through a crowd of Koreans to get out at the end. Most Koreans are expert pushers and line cutters. No sense in getting galloped to death. I’m glad PSY took a break from dancing-it-up with Britney Spears on The Ellen Degeneres Show to make an appearance at Seowon University in Cheongju, South Korea. It’s nice to know he remains loyal to his roots (and binding contracts). I’m thankful for the opportunity to have seen him perform live, and I’ll never forget the experience (or the events that led up to it).